VISITS raises 570 million yen. Joint research into HR Technology with PERSOL HOLDINGS accelerating. VISITS Technologies (Prev. VISITS WORKS, based in Minato-ku, Tokyo / CEO: Masaru Matsumoto) has established the terms of the financial and business collaboration with PERSOL HOLDINGS (based in Shibuya-ku, Tokyo / CEO: Masamichi Mizuta). At the same time, VISITS Technologies has also raised 570 million yen through a third-party allocation of new shares with Vector Inc., MUFJ Capital, existing shareholders among others participating in the funding round. Through also changing the company name to VISITS Technologies and strengthening our operating capacity, VISITS will continue to grow as a HR Tech company. In recent years, more and more people even within Japan have raised the needs for work reform and increasing productivity. With the digital shift within the HR fields too, each day our hopes increase for a world where each person can appreciate the value that their work brings about and where everyone can take pride in their lives. VISITS’ mission is to show to everyone their possibilities, and allow them to design their own life paths through the use of technology. Since its founding in June 2014, VISITS has been working on a whole range of products in pursuit of this. The first was VISITS OB, which connected students to the most dynamic working adults in society, which VISITS launched in December 2015. Through our close collaborations with DISCO, we have reached 500 thousand “matches” between users on our service within a period of a year and 8 months. VISITS OB has been steadily gathering support from its users through providing them with a chance to think about their future paths without being strictly bound by industry types and company reputations. Recently, VISITS has established the basic terms of collaboration with PERSOL CAREER Inc. (formerly Intelligence Inc.), one of the core companies held by PERSOL HOLDINGS Inc. Through sharing VISITS’ strengths, including data analysis and algorithm development in return for PERSOL’s knowledge about the HR sphere which it has accumulated over many years, VISITS will develop technologies tied to both companies’ core businesses including dispatch, career changes, BPOs etc. VISITS will also use this collaboration to develop to both technologies and talent which can contribute to the HR Tech sphere. VISITS Technologies has conducted a third-party share allocation, with PERSOL INNOVATION FUND LLC., Vector Inc., MUFJ Capital, current shareholders and other angel investors participating. 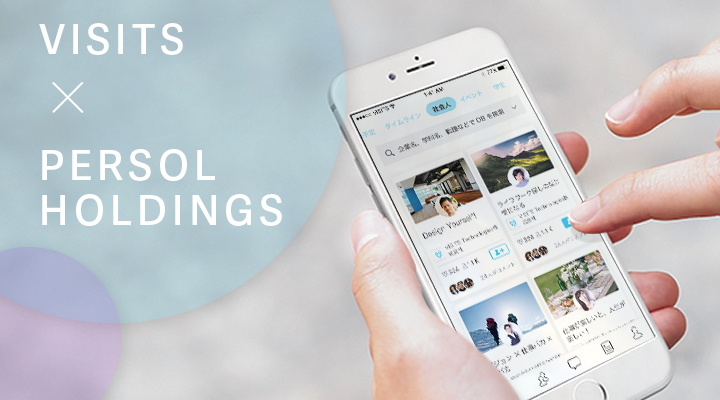 After adding a loan from the Japan Finance Corporation to support new disruptive and innovative ventures, VISITS has raised a total of 570 million yen. These funds will be used to invest in new business collaborations between PERSOL Group and VISITS, to hire engineers / data scientists and to further raise the impact which VISITS OB has on our users. We will be strengthening our data scientist teams through welcoming Takashi Hatanaka, former Managing Director at Goldman Sachs (Asia) and Minoru Kuriyama, who has had a long career as a Data Scientist at McKinsey & Company. We are also welcoming the Representative Partner of PERSOL INNOVATION FUND, Takeyuki Kato, who is very well versed in the HR field, as a Board Member to assist us with the commercialization of the technology we develop. In order to strengthen our service development, we are also welcoming Tsuyoshi Matsuoka, former Mixi CTO, as our technical advisor in order to improve our service and what we can offer to our users. In order to boost our management capacity, we are also welcoming Koichiro Naruse, former Sales Department Head of Opt Inc. (Current Opt Holdings) and former Hottolink COO as a board member and to lead our overall management and strategy. We are also welcoming Hironori Zoda, former Drecom CFO, Zappalas internal management head and Certified Accountant, as our CFO / Board Member to strengthen our financial and internal structures. Minoru joined McKinsey and Company after graduating from the Graduate School of Science at the University of Tokyo. He was involved in multiple fields of consulting, including data analysis and strategic development, with many large firms as clients. Through blending business and science, he is involved with the development and optimizing of algorithms, strategic development etc. based on customer behavior data. Certified Accountant. Formerly in Deloitte Touche Tohmatsu LLC where he was involved in auditing and IPO preparations for client companies. Former Drecom Co. Ltd Head of Internal Administration and Zappalas Inc. Head of Internal Management, where he has been Involved in the issuing of new stocks, M&As and a wide range of management tasks. Hironori assumed the CFO / Board Member position of Nobot Inc. in 2009 where he led the company to be acquired from KDDI within 2 and a half years of incorporation. Koichiro joined Opt Inc. when it was just starting up in 1997 and held management positions in departments including sales, marketing and mobile. In 2007, he transferred to Hottolink and assumed the role of COO. He successfully pivoted Hottolink from development outsourcing to providing SaaS services and brought it to its going public on the TSE MOTHERS. Currently Deputy CEO / Board Member of Warranty Technology Inc.
Takeyuki joined Intelligence (now PERSOL CAREER) in 1998 after graduating from the Faculty of Commerce and Management, Hitotsubashi University. Since joining Intelligence, he has had experience in managing the headhunting, mid-career job-change media, labor dispatch and outsourcing divisions as well as starting 6 different business within the company. He is currently the Representative Partner of PERSOL INNOVATION FUND and is responsible for PERSOL Group’s initiatives in promoting open innovation. Joined Goldman Sachs in 1993 after graduating from the Graduate School of Engineering and Faculty of Engineering of Kyoto University. He was involved in the development of trading systems in the IT department as well as data modeling, risk management and stock derivative trading under the quants department in the Goldman Sachs New York headquarters. He later became a managing director at Goldman Sachs (Asia), leading the stock derivative and quants trading departments. Joined the first batch of Yahoo! Japan’s engineers and has handled multiple products and product security. Has handled the creation of multiple products under Mixi and assumed the CTO / Board member after while also functioning as head of HR. Established rector after working in another B2B startup. VISITS Technologies aims to show to everyone their possibilities, and allow them to design their own life paths through the use of technology. It currently operates VISITS OB, a career design platform.